I haven’t been posting in english for a while now, mostly because i figured i don’t have that many non-german readers but also because it is more convenient. but this one has to happen in english. for funsies. we all love google maps. especially when we can see single roof tiles missing from our homes or naked people sunbathing in the netherlands. that is why i’m always excited when google does something about the resolution of its satellite images. earlier in september a new satellite, geoeye-1, was launched and has now taken its first pictures. 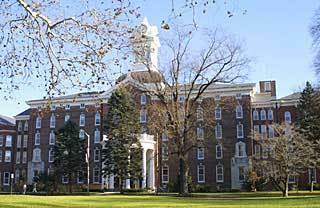 surprisingly of the kutztown university campus, one of the few universities i visited during my time in the US. this is also the same university that is prominently featured on some of my bedroom attire and keychain (not a metaphor.) anyway, i just read this on slashdot and thought maybe some of you might enjoy either google news, high res satellite pictures or juicy comments about my keychain.